Crafting With Craig: Indigo Blu 8x8 Christmas card. "Merry Christmas, Deer" Indigo Blu stamp - code; CDI. 12x12 page from "Tis the season" paper pad - Dovecrafts. 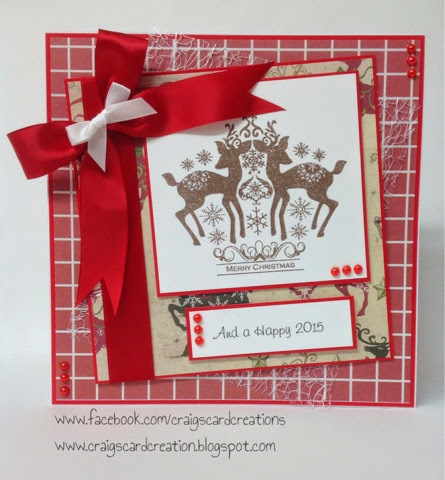 12x12 page from "Back to Basics Christmas" modern paper pad - Dovecrafts. Neenah stamping card - Crafters Companion. Robin Red Adorable Scorable card - Hunkydory. 25mm red satin ribbon - American Crafts. 10mm white satin ribbon - America. Crafts. Double sided tape - Stix 2. Great card Craig, Love the colours and the layout. I made an 8x8 card for the challenge this month. Thank you Sarah, I just love 8x8 sized cards. Really lovely card Craig, glad you found us at the Indigoblu challenge, look forward to seeing more from you. Good luck.